Well... What should I do now? 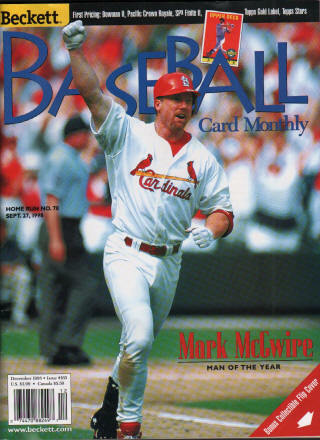 I've had this page on my website for almost 20 years, but now that Mark has admitted to performance enhancing drug use during his Cardinal years, I'm not sure if I should have this "tribute" on my website at all. I'm leaning towards taking this page down. What do you think? Good-Bye Big Mac! It's been unbelievable!!! 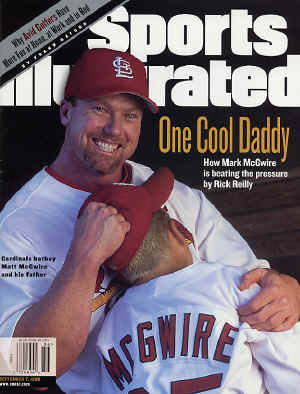 It's going to be hard to go to a Cardinals game or watch them on TV next year without thinking about they last four seasons. 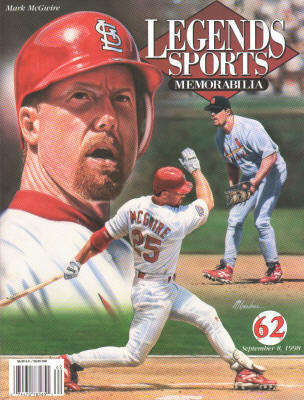 The anticipation and excitement of each McGwire plate appearance will be greatly missed. 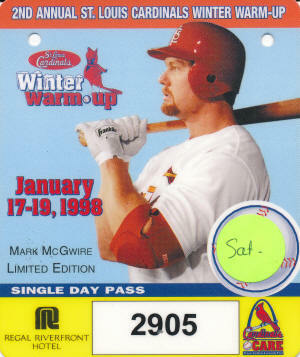 The getting to the ballpark way early just to see him crank a few into the cheap seats. The staying the entire game (which I always do anyway) just hoping the Big Man would get one more chance. 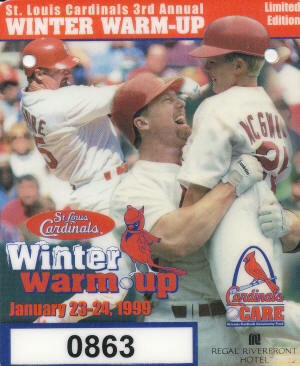 The whole way Cardinals fans approach a game will change. But WOW, I wouldn't give up the past four years for anything, would you!!!! When I first heard Mark had made it official, I couldn't believe it... 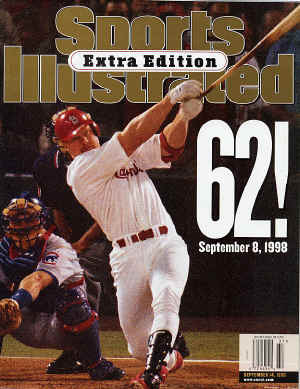 Here is a man who is 17 home runs away from 600 and absolute baseball immortality (with Aaron, Ruth and Mays) and he throws in the towel?!?!?! However, that's the kind of person he is and looking back on it what else would we expect? 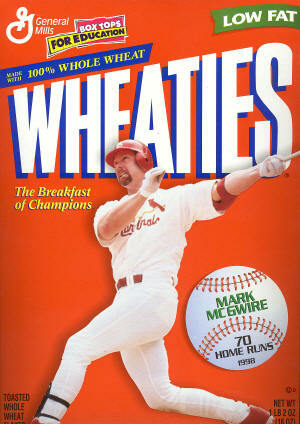 He gave to baseball and its fans all he had and when he thought he didn't have anything more, he said good-bye. What else is there is say. 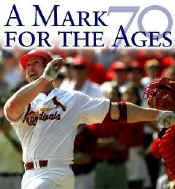 "Last January, Mr. DeWitt and I verbally agreed on a generous two-year contract extension from the Cardinal organization. After considerable discussion with those closest to me, I have decided not to sign the extension, as I am unable to perform at a level equal to the salary the organization would be paying me. 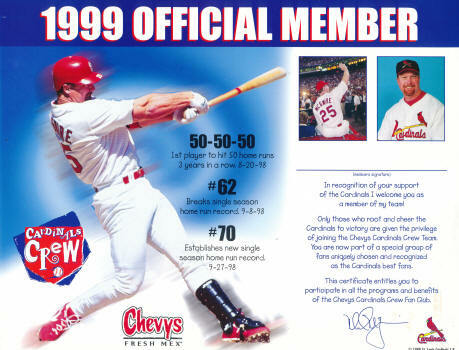 I believe I owe it to the Cardinals and the fans of St. Louis to step aside, so a talented free agent can be brought in as the final piece of what I expect can be a World Championship-caliber team. So, I am walking away from the game that has provided me opportunities, experiences, memories and friendships to fill 10 lifetimes. For years I have said my motivation for playing wasn't for fame and fortune, but rather the love of competing. 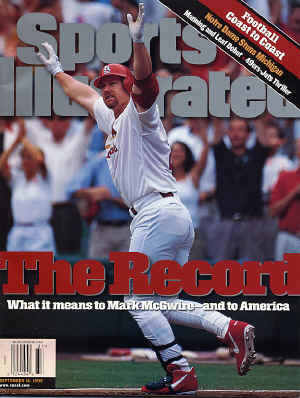 Baseball is a team sport and I have been lucky enough to contribute to the success of some great teams. 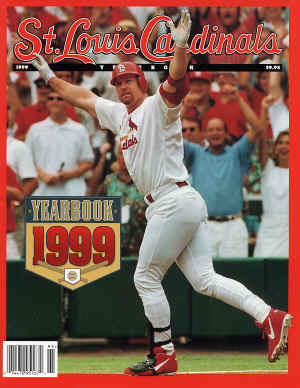 I want to thank the St. Louis Cardinal organization, Mr. DeWitt, Mr. Jocketty, Tony La Russa and the thousands of Cardinal faithful for making St. Louis home for the past four years. I want to thank the Oakland A's and all of the fans in California for giving me my start, and the millions of baseball fans around the world who have inspired me to compete night in and night out." 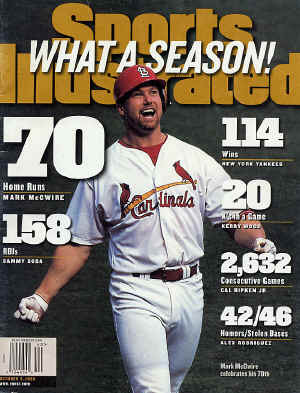 Although Mark was only with the Cardinals for a few years, he made his presence known in an unbelievable way. 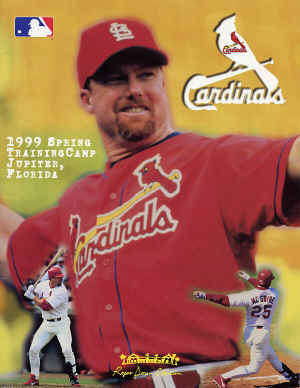 He has caused as much excitement in the past couple of years as if the Cards had won the World Series. 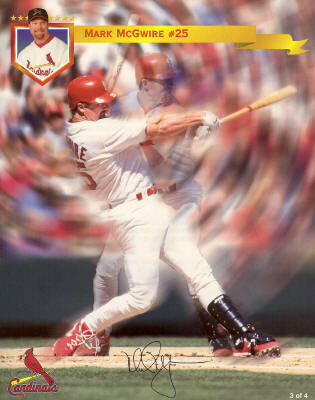 When Mark swings the bat, the camera flashes are something to see. He has almost single handedly made baseball the national pastime once again and his humble attitude has won the hearts of all baseball fans! 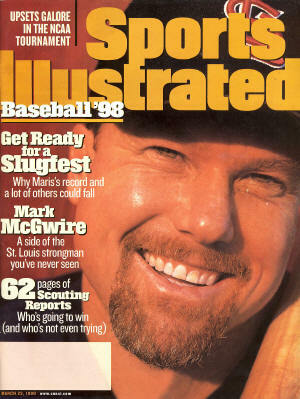 The Sporting News has ranked Mark number 91 in their list of the top 100 greatest players of all time!!!! 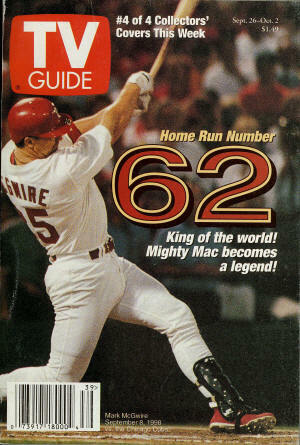 Ties Willie Mays' ML record for most consecutive games homered in (4) to start a season. 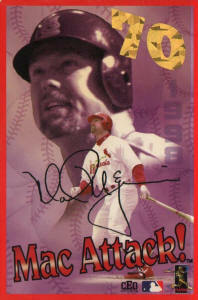 400 HRs in fewest at-bats - (4,726) in ML history. 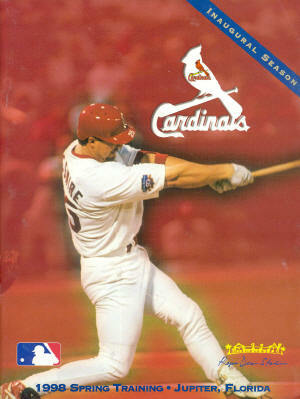 From 1995 to 2000, amassed 316 homers and just 308 singles. 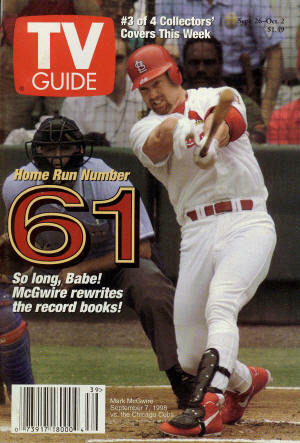 Career HR/AB ratio of 10.6. Season totals listed in red denote the player led the entire ML in that category. "It was an awesome baseball moment... 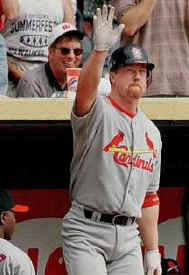 Opening Day, bases loaded, the star -- the modern day Babe Ruth -- comes up and hits a grand slam." 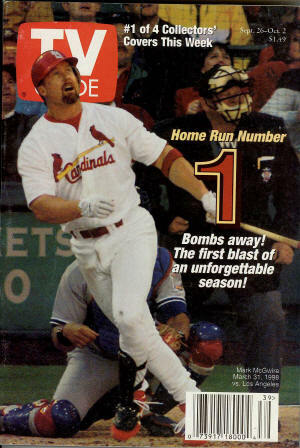 -- Cardinals ex-third baseman Gary Gaetti commenting on Opening Day, 1998. "He's like an amusement park ride, even for guys who play." -- Phillies outfielder Ruben Amaro. 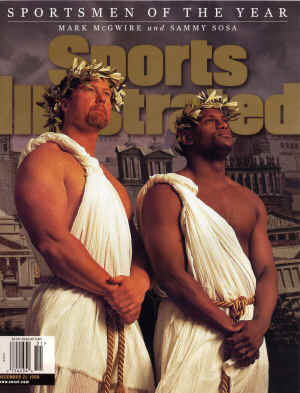 "People will be wondering if they did that with Babe Ruth." 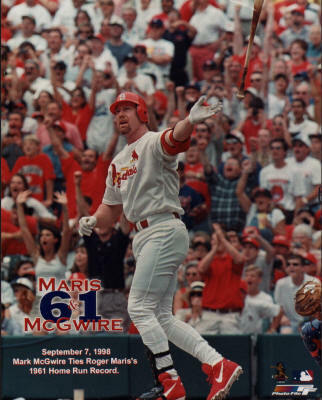 -- Giants pitcher Orel Hershiser, who said Manager Dusty Baker "made a legend" of McGwire by having him intentionally walked with two outs and nobody on base in the 14th inning. 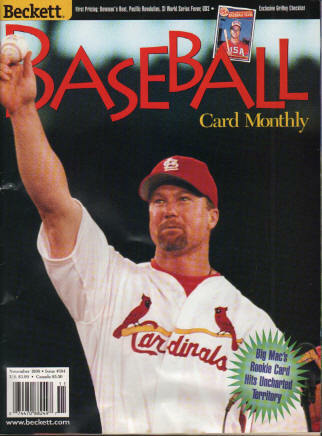 In 1998, Mark McGwire was named Player of the Month in April, May, and September. He thus became the first man in the 40-year history of the award to be honored three times in one year. 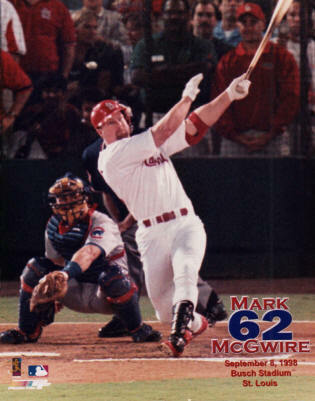 Mac had also won it in Setember 1997, giving him three straight citations - another first - and four awards in his first eight months in the NL. 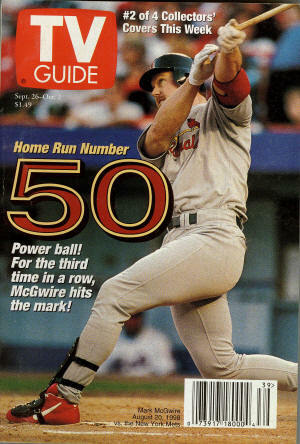 McGwire had won only one POM in 11 years in the AL. 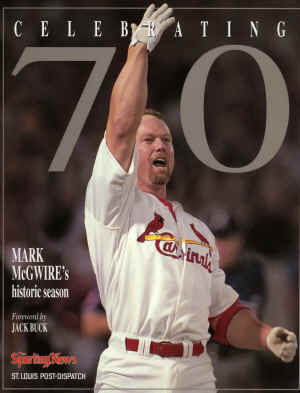 - St. Louis Cardinal Gameday Magazine, "Official Commemorative Edition"